Recent debates over the evolutionary relationships of early echinoderms have relied heavily on morphological evidence from the feeding ambulacral system. Eumorphocystis, a Late Ordovician diploporitan, has been a focus in these debates because it bears ambulacral features that show strong morphological similarity to early crinoid arms. Undescribed and well‐preserved specimens of Eumorphocystis from the Bromide Formation (Oklahoma, USA) provide new data illustrating that composite arms supported by a radial plate that bear a triserial arrangement of axial and extraxial components encasing a coelomic extension can also be found in blastozoans. Previous reports have considered these arm structures to be restricted to crinoids; these combined features have not been previously observed in blastozoan echinoderms. Phylogenetic analyses suggest that Eumorphocystis and crinoids are sister taxa and that shared derived features of these taxa are homologous. The evidence from the arms of Eumorphocystis suggests that crinoid arms were derived from a specialized blastozoan ambulacral system that lost feeding brachioles and strongly suggests that crinoids are nested within blastozoans. The evolutionary relationships of early Palaeozoic echinoderms are poorly understood. This is especially apparent when considering the phylogenetic relationships of stemmed echinoderms, where it has yet to be resolved whether the presence of a stem is homology or homoplasy (Ausich et al. 2015). Early echinoderms diversified rapidly through both the Cambrian Explosion and the Ordovician Radiation, which resulted in high morphological disparity (Sprinkle 1980; Sumrall & Waters 2012). This high disparity is reflected in approximately 21 named taxonomic classes but the true diversity of Echinodermata cannot be understood until phylogenetic relationships of the major groups are resolved, as many of these taxonomic classes are likely not to be monophyletic groupings. The phylogenetic relationships that crinoids share with other echinoderm clades have been widely debated and many hypotheses have been proposed (e.g. Paul 1988; Sumrall 1997; Ausich 1998; David et al. 2000; Guensburg & Sprinkle 2007, 2009; Guensburg et al. 2010; Guensburg 2012; Kammer et al. 2013; Ausich et al. 2015; Guensburg et al. 2016; O'Malley et al. 2016). A number of arguments against crinoids and blastozoans sharing common ancestry have been made based on a priori assumptions of morphological trends and the identification of ‘key’ features having stronger significance in determining ancestry without quantifiable justification. Further, the majority of these arguments have not been presented within a rigorous computational phylogenetic context to test proposed relationships (Guensburg & Sprinkle 2007, 2009; Guensburg et al. 2010). Eumorphocystis Branson & Peck, 1940, a Late Ordovician glyptosphaeritid diplopore‐bearing blastozoan, has been at the centre of many recent debates concerning crinoid origins among stemmed echinoderms. The unusual structure of the exothecal extensions of the feeding ambulacra of this taxon bears a striking resemblance to the arm structures of early crinoids (Parsley 1982; Paul 1988; Sumrall 2010) and is very dissimilar to other diploporitans (Diploporita is probably a polyphyletic grouping of blastozoans: Paul 1988; Sheffield & Sumrall 2015, 2017). Features shared by Eumorphocystis and early crinoids include: a triserial plate arrangement of the arms; a uniserial arrangement of the thecally derived plates on the outer portion of the arm; a single supporting thecal plate for the extension of the arm (herein referred to as a radial plate); and the presence of a coelomic canal. We show that phylogenetic analyses support Eumorphocystis as the sister group of crinoids and character optimization supports the suggestion that these arm features are homologous, and the hypothesis that crinoids are rooted within blastozoans. A common problem in echinoderm palaeontology is that skeletal elements are commonly named based on location or function rather than evolutionary lineage. Such naming schemes can result in individual names being used for a variety of unrelated plate types across echinoderm groups; this issue is highlighted within the stemmed echinoderm group (see Sumrall & Waters (2012) for a comprehensive list of problematic names for homologous skeletal elements across Palaeozoic echinoderms). These issues act as a barrier to understanding skeletal element homology in echinoderms. As morphological characters for phylogenetic analysis are constructed as hypotheses of homology (Patterson 1988; Sumrall 1997), understanding the homology of these elements prior to phylogenetic coding the morphology is of critical importance when trying to infer accurate evolutionary relationships. Universal elemental homology (UEH) identifies ambulacral homology using the Carpenter system (Carpenter 1884), which focuses on the plate types bordering the peristome and the ambulacral system (Sumrall 2010, 2017; Sumrall & Waters 2012; Kammer et al. 2013). This homology scheme is useful for identifying deep homologies within Echinodermata. The other leading homology scheme that is used for echinoderm phylogenetics, the extraxial–axial theory (Mooi et al. 1994; Mooi & David 1997, 1998, 2008; David et al. 2000) is much coarser and differentiates the echinoderm skeleton into two large categories: axial (skeletal parts associated with the mouth and ambulacral system) and extraxial (the body wall); UEH refers only to elements within the axial system (Sumrall 2017). For the purposes of this study, certain morphological terms are defined here. True arms are defined following Zamora & Smith (2011): those arms with a central lumen, or coelomic canal, which are directly connected to the theca. Guensburg et al. (2016) added to this definition, suggesting that arms also have both axial and extraxial skeletal components together with the coelomic canal. An erect ambulacrum is one that is not attached to the surface of the theca distally; it may or may not have an extension of the extraxial skeleton or brachioles. Arguments against shared blastozoan and crinoid ancestry have primarily emphasized differences between crinoid and blastozoan morphology (e.g. Guensburg & Sprinkle 2001, 2007, 2009; Guensburg et al. 2016) and are rooted in arguments of homology versus homoplasy. These arguments were made by highlighting ‘key’ features that drove the separation between the blastozoan and crinoid groups, rather than using rigorous phylogenetic methodology. Guensburg et al. (2016) also asserted that superficial similarities shared by blastozoans and crinoids (e.g. homoplasy) are probably related to plesiomorphic pentaradial patterns of stemmed echinoderms, an argument that is not rooted in phylogenetic understanding, as it confuses the definitions of homology and homoplasy (Sumrall 2017). In contrast, phylogenetic arguments are rooted in the discovery of suites of synapomorphies providing support for nodes within proposed evolutionary trees. Previous arguments posit that crinoids were probably derived from a Cambrian edrioasteroid ancestor (see Guensburg & Sprinkle 2001, 2007; Guensburg et al. 2016). Morphological evidence for this hypothesis focuses on shared biserial floor plates bearing through‐going pores and branched ambulacra in both edrioasteroids and crinoids. Branching of ambulacra is well documented in blastozoans including the eocrinoid Lyracystis, the hemicosmitid Caryocrinites and several glyptocystitoids including Stribalocystites, and Callocystites. Further, Guensburg & Sprinkle (2001, 2007, 2009) argued that blastozoans have no extraxial components of the arms and lack coelomic canals, both of which are present in Eumorphocystis, and emphasize differences in stem and thecal plating between crinoids and blastozoans. A priori assumptions of evolutionary relationships based on the presence or absence of features must be tested within rigorous phylogenetic analyses. The earliest crinoids appear in the Early Ordovician (the problematic Cambrian genus Echmatocrinus is not considered to be a crinoid in this analysis; Ausich & Babcock 1998; see Sprinkle & Collins 1998 for an alternative view) later than the first groups of blastozoans, which appeared in the early Cambrian (Zamora et al. 2013). This difference in timing of origins has been used as an argument against crinoids being nested within blastozoans (e.g. Guensburg & Sprinkle 2001, 2007, 2009). However, the timing of crinoid origins is fully consistent with their placement within the blastozoan tree; numerous groups of blastozoans appear at the same time as the crinoids with no obvious deeper lineages (e.g. all major groups of diploporitans (Kesling 1967; Lefebvre et al. 2013), parablastoids (Sprinkle & Sumrall 2008) and new glyptocystitoid rhombiferans appear in the latest parts of the Cambrian (Zamora et al. 2016)). Further, it has been argued that because Eumorphocystis is a derived Late Ordovician taxon, it cannot possibly have a sister group relationship with early crinoids (Guensburg et al. 2016). This argument ignores the fact that, as sister taxa, crinoids and Eumorphocystis are both derived from lineages that share an earlier common ancestor. To perform a phylogenetic analysis, a character matrix was constructed to include 10 taxa and 69 characters, of which 29 were parsimony‐informative (for character list and nexus file of codings see Sheffield & Sumrall 2018). Taxa selected included Eumorphocystis and a range of early crinoid, blastozoan and edrioasteroid taxa; Kailidiscus was chosen as the outgroup to polarize character state transformations (refer to Table 1 for all taxa included in analysis). PAUP* v. 4.0a147 (Swofford 2003) was used for all analyses, utilizing using both parsimony and maximum likelihood algorithms (maximum likelihood in PAUP* v. 4.0a147 uses the Mkv model for morphologic characters; Lewis 2001); uninformative characters were removed from the analysis. A branch and bound search algorithm was used to uncover optimal trees and was computed via a step‐wise addition sequence for the parsimony analysis; an heuristic search algorithm was used to uncover the most likely trees in the maximum likelihood analysis. All characters were unordered and equally weighted. Tree support was determined using bootstrap analysis (Felsenstein 1985). CMCIP, Cincinnati Museum Center, USA; GM, Paleontology Museum of Guizhou University, China; NHMUK, Natural History Museum, London, UK; OU, University of Oklahoma, Norman, USA; PE, Field Museum of Natural History, Chicago, USA; PIN, Borissiak Paleontological Institute Russian Academy of Sciences, Moscow, Russia; PMO, Natural History Museum, University of Oslo, Norway; SUI, University of Iowa, USA; USNM, United States National Museum, Washington DC, USA. A constrained topology analysis was performed to test the veracity of the edrioasteroid origin of crinoids on the present matrix. The constrained tree topology forced crinoids (Hybocrinus, Gaurocrinus and Carabocrinus) and edrioasteroids (Edriophus) to form a clade as a polytomy. 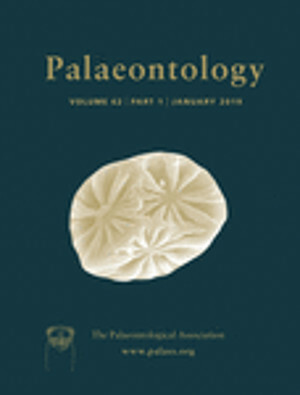 All other taxa were reduced to a polytomy with the crinoid–edrioasteroid clade and Kailidiscus was used as the outgroup to polarize character distributions of inferred trees; code to perform this function was added to the original nexus file. This tree topology was explored using the same analytical techniques as above. A Templeton test (Templeton 1983) was then run, to compare trees inferred with and without topological constraints, to determine if the two trees are significantly different in length; two random trees were placed into a new nexus file and compared against one another. All specimens for this analysis are reposited in museum collections; a list of the taxa studied, specimen numbers, and museum repositories is located in Table 1. All studied specimens came from the following museum collections: CMCIP, Cincinnati Museum Center, USA; GM, Paleontology Museum of Guizhou, China; NHMUK, Natural History Museum, London, UK; OU, University of Oklahoma, USA; PE, Field Museum of Natural History, Chicago, USA; PIN, Borissiak Paleontological Institute Russian Academy of Sciences, Moscow, Russia; PMO, Natural History Museum, University of Oslo, Norway; SUI, University of Iowa Paleontology Repository, USA; USNM, United States National Museum, Smithsonian Institution, Washington DC, USA. The parsimony analysis returned four most optimal tree with 53 steps (Fig. 1; CI = 0.792, RI = 0.810, HI = 0.208). Two major clades were recovered; the first clade contains all crinoids (Carabocrinus and Hybocrinus as sister taxa (bootstrap support of 74%) and Titanocrinus and Gaurocrinus as sister taxa (bootstrap support of 78%)) with Eumorphocystis as its sister taxon. This is well supported by bootstrap analysis, with the relationship of Eumorphocystis to crinoids having bootstrap support of 91%. The second clade contains rhombiferans Hemicosmites and Cheirocrinus and has a bootstrap value of 58%; sister to this clade is the coronoid Stephanocrinus. The eocrinoid Gogia and edrioasteroid Edriophus are most distantly related to taxa within these two clades. Synapomorphies for the recovered clade containing Eumorphocystis and crinoids are: (1) ambulacral system erect as composite structure; (2) presence of coelomic canal; and (3) presence of arm generating plate (radial plate). The maximum likelihood analysis returned a consistent tree topology, with a most likely tree (score of −167.38). The bootstrap support for the clades varied slightly from the values obtained from the parsimony analysis (Fig. 1). Figure 1 Open in figure viewerPowerPoint Optimal tree inferred from this study using both parsimony and maximum likelihood; tree shown is the 50% majority rule following bootstrap analysis. Bootstrap values are indicated at the appropriate node; the parsimony analysis bootstrap value is presented first, maximum likelihood value second. Eumorphocystis is sister taxon to crinoids (support value of 91/61); Stephanocrinus is sister taxon to rhombiferans, Hemicosmites and Cheirocystis (support value of 58/52). Parsimony: tree length = 53, CI = 0.792, RI = 0.810, HI = 0.208; maximum likelihood: tree score: −167.38. To test whether crinoids are closely related to edrioasteroids, an analysis was conducted that constrained tree topologies only to those that recovered a crinoid clade (Carabocrinus, Hybocrinus and Gaurocrinus) as sister taxon to Edriophus. Four optimal trees (utilizing maximum parsimony) were recovered with a tree length of 62 (CI = 0.677, RI = 0.655, HI = 0.323; Fig. 2). Other relationships uncovered in the analysis without topological constraints (e.g. Stephanocrinus as sister taxon to rhombiferans) were retained. Figure 2 Open in figure viewerPowerPoint Constraint tree topology, forcing edrioasteroids and crinoids to be sister taxa. Most optimal tree within the topological constraints enforced. This phylogenetic hypothesis, proposed by Guensburg & Sprinkle (2001) is significantly less parsimonious than the one presented in this study. Tree length = 62; CI = 0.677, RI = 0.655, HI = 0.323. The Templeton test compared a randomly selected most parsimonious tree (without topological constraints) with a length of 53 steps and a randomly selected most parsimonious tree with topological constraints forcing edrioasteroids to be sister group to crinoids with a length of 62. This test was performed to determine whether or not these two randomly selected trees from this analysis were significantly different from one another. The Templeton test indicated that the two trees are statistically significant from one another; the most parsimonious tree, that has Eumorphocystis as sister group to crinoids, is statistically shorter and more parsimonious; the test returned a p‐value of 0.0201. The arms of early crinoids and Eumorphocystis are here interpreted as homologous structures based on Patterson's tests of homology (1988) specifically: similarity and congruence. Eumorphocystis arms (Fig. 3A, B) have a triserial plate arrangement: (1) a uniserial, extraxial component of brachial plates on the outer edge of the arm, composed solely of non‐pore bearing plates derived from the theca; this plate series is supported on all five arms by a single non‐pore bearing thecal plate, which is homologous to the radial plate of a crinoid; (2) singly biserial, axial floor plates that form the food grove and provide mounting facets for food gathering brachioles; and (3) axial ambulacral cover plates that overlay the floor plates and protect the food groove. The biserial floor plates and the uniserial brachial plates enclose a coelomic canal that extends from the end of the erect arm and pierce the theca. Figure 3 Open in figure viewerPowerPoint Arm morphology of Eumorphocystis multiporata. A, radial view of erect arms of E. multiporata. B, radial view of erect arms of E. multiporata with triserial arm arrangement interpretation. Blue = uniserial, extraxial brachial plates derived from thecal plates, with supporting radial plate initiating the series. Green = singly biserial, axial ambulacral floor plates. Yellow = axial ambulacral cover plates. Red = oral plates. Note the coelomic canal that is positioned between the brachial plates and the ambulacral floor plates. Scale bar represents 0.5 cm. The triserial arrangement of Eumorphocystis described above is nearly identical to that seen in early crinoid arms (Fig. 4A, B), where: (1) the extraxial brachial plates derive from the theca, and are supported by a radial plate; (2) biserial, axial ambulacral floor plates are present; and (3) axial ambulacral cover plates cover the food groove. As is the case with Eumorphocystis, the coelomic canal of a protocrinoid is contained between the brachial plates and the ambulacral floor plates (the phylogenetic placement of protocrinoids within Crinoidea has been debated; see Guensburg (2012), Ausich et al. (2015), Cole (2017), Wright et al. (2017) for discussions concerning their relationships). While Guensburg et al. (2016) interpreted blastozoans as lacking extraxial brachial plates, it is clear that Eumorphocystis does indeed have a triserial arrangement with thecally derived (extraxial) brachial plates (Fig. 3A, B). The uniserial nature of these plates is consistent with the arrangement in early crinoids. Figure 4 Open in figure viewerPowerPoint Triplate arm arrangements of Eumorphocystis and an early crinoid are homologous with one another; these cross‐sections show extraxial thecally‐derived brachial plate (dark grey), axial, biserial ambulacral floor plates (light grey), and axial ambulacral cover plates (white). Coelomic canal coloured black. A, cross‐section of Eumorphocystis arm. B, cross‐section of early crinoid arm, modelled after Apektocrinus (modified from Guensburg et al. 2016). There are some notable differences between the ambulacral systems of early crinoids and Eumorphocystis; this analysis does not take the position that every element of the axial skeleton is entirely similar. The proximal food grooves of Eumorphocystis are developed on sutures between the oral plates and extend onto the sutures of alternating biserial floor plates (Fig. 5A). In Carabocrinus, the proximal food grooves are confined to the oral plate sutures and presumed soft anatomical structures that extend over the coelomic canal as floor plates are absent (Fig. 5B). The coelomic canal of Eumorphocystis perforates the thecal wall at the junction between the proximal ambulacral floor plates and plating of the thecal wall (Fig. 3A, B), whereas in crinoids, such as Carabocrinus, the coelomic canal perforates the thecal wall at the junction between the oral plates and the thecal wall (Fig. 5B). While this may seem different, it is effectively the same place because most crinoids lack calcified floor plates and in those taxa that bear them, such as protocrinoids (Guensburg & Sprinkle 2009; Guensburg 2012; Guensburg et al. 2016), the position of the coelomic canal is probably identical to that seen in Eumorphocystis. Crinoids, such as Titanocrinus, have podial pores in the flooring plates, whereas Eumorphocystis does not. Furthermore, a small plate series on the most proximal arm between the floor plates and the brachial plates (Fig. 5) is found in many crinoids, including protocrinoids. The most significant difference between Eumorphocystis and the early crinoid ambulacral systems is that Eumorphocystis, like all non‐crinoid blastozoans, has brachioles for feeding. However, it is not unreasonable to consider that early crinoids lost brachioles in much the same way as crinoids lost their ambulacral floor plating series in more derived forms (Guensburg et al. 2016). Further, crinoids have also more than once re‐evolved uniserial pinnules for feeding, within the cladid, disparid and camerate clades (Ausich 1988). The phylogenetic analyses and statistical test presented in this study together are a posteriori tests of the hypothesis that the most parsimonious arrangement (corroborated by a consistent result from a maximum likelihood analysis) of the evolutionary tree is one that assumes that arm features of early crinoids and Eumorphocystis arms are homologous structures. In the optimal tree presented here, the explanation supported by the data is that the arm features present in both groups of taxa are homologous. This analysis corroborates a growing number of phylogenetic analyses utilizing solely morphological data that place crinoids within the larger blastozoan clade (Paul & Smith 1984; Sumrall 1997; Ausich et al. 2015; Cole 2017), as well as an analysis utilizing preserved organic molecules (O'Malley et al. 2016). Arguments that have been made previously against crinoids being nested within blastozoans did not use a phylogenetic analysis to test the assertions being made and were not supported by morphological evidence as provided by UEH (David et al. 2000; Guensburg & Sprinkle 2001, 2007, 2009; Guensburg et al. 2016). The constraint analysis tests this model further by determining whether the ‘crinoids derived from edrioasteroid’ model (Guensburg & Sprinkle 2001, 2009; Guensburg et al. 2016) is viable on the current matrix (see Sheffield & Sumrall 2018) Constraining the tree morphologies to only those consistent with the edrioasteroid model resulted in a tree that was considerably less parsimonious, as it added seven steps to the tree length. A Templeton test, which statistically compared two trees, one without topological constraints and one with topological constraints, indicated that the two trees are significantly different from one another. Our interpretation of these data is that crinoids being rooted within edrioasteroids is not well supported by current data. Based on these results, we reject the hypothesis that crinoids originated from edrioasteroids. Figure 6 Open in figure viewerPowerPoint Eumorphocystis multiporata (SUI 97599). A, radial side view; theca globular to elongate with numerous, irregular plates; plates are convex and raised ridges run across the centre of many of the plates; distal arms branch exothecally and are supported by single non‐diplopore bearing thecal plate; distal end narrows into four equal‐sized basal plates that form around stem; stem holomeric, with two distinct columnal sizes, one being twice as high as the other. B, view of stem; stem has a circular and proportionally small lumen; stem lacking crenulae. C, oral view; five ambulacra branch from the mouth; primary food grove lies down on periradial suture; short grooves leading from the primary food groove end in brachiole facets that are attached in the centre of single ambulacral floor plates, alternating from the left and right side of the primary food groove, with the first brachiole facet branching on the left; total length of ambulacra unknown. Scale bar represents 1 cm. Eumorphocystis multiporata Branson & Peck, pp. 88–92, pl. 13. Regnellicystis typicalis Bassler, pp 276–277, p. 275, figs 6–8. Strimplecystis oklahomensis Bassler, p. 277, p. 265, fig. 19. Eumorphocystis multiporata Branson & Peck, 1940; 6757 University of Missouri. Theca, approximately 16 mm in height and 13 mm at the widest point, slightly globular to elongate oval shape with large number of irregularly arranged, polygonal plates (Fig. 6A, B); ambulacra arranged in 2‐1‐2 symmetry and oral plates each bear a high spine and border the peristomial opening; CD interray contains O1, with no evidence of O6 or O7; oral plates are non‐diplopore bearing (Fig. 6C). Primary peristomial cover plates are undifferentiated from the cover plate series; presence of either hydropore or gonopore is not discernable. Periproct located in CD interray, 0.25 mm in diameter, in contact with oral plate in the CD interray; appears to be composed of numerous small plates but disarticulation prevents further detailed descriptions. Ambulacra divided into proximal recumbent portion and distal erect portion. Proximally, ambulacral floor plates are highly differentiated from cover plate series, wedge shaped, singly biserial and alternate with primary food groove along periradial suture; periradial suture follows a zigzag pattern across the theca. Floor plates non‐diplopore bearing; brachioles are mounted in the centre of each ambulacral food plate. Proximal food groove is covered by doubly biserial ambulacral cover plates; distal food groove is formed into erect, triserially‐arranged arms (Fig. 6C). Portion of arms are exothecally derived from a uniserial extension of the extraxial skeleton; entire arm is supported by a single non‐diplopore bearing thecal plate at the base of the arm connecting with the uniserial extraxial plates (Fig. 6A). Uniserial plates are overlain by singly biserial ambulacral floor plates. The union of biserial ambulacral floor plates and uniserial exothecally‐derived plates is pierced by lumen that runs throughout the appendage and pierces the theca. Brachiole plates articulate directly to short, equant ambulacral floor plates; brachioles extend from the main food groove and attach to the centre of a single floor plate via a short, narrow groove. Uniserial brachioles alternate from left and right along main food groove; first brachiole extending from each ambulacrum is on the left side. Total length of distal ambulacra unknown (Fig. 6C). Thecal plates irregularly shaped, typically five or six‐sided with roughly equal suture lengths, though the plates vary widely with respect to size. The largest thecal plates, presumably primary generation of plates, are typically between 1.0 and 1.5 mm in diameter, whereas presumably secondary generation plates are typically between 0.25 and 0.5 mm in diameter; smaller plates typically roughly quadrangular. The surfaces of the plates are not marked with pits or granulose textures and without evident growth lines; new plates are irregularly added anywhere within the thecal plating. Ridges running horizontally, vertically and diagonally radiate from each arm (three from each arm) across the theca (Fig. 6A). Ridges run from plate centre to plate edge and are much higher towards centre of the plate than at the edge. The thecal plates are noticeably convex and are arched towards the centre of the plate; the sutures between the plates are clearly defined and deeply depressed in all places not altered by taphonomic overprint. Diplopores are simple paired perpendicular canals within very shallow elliptical peripores; average distance between the perpendicular canals is 0.5 mm; average diameter of the pores is 0.2 mm. Each pair of perpendicular canals enters the coelom separately. The diplopores are irregularly clustered, generally within the plate centre; some diplopores cross plate sutures, most commonly in conjunction with smaller plates. Thecal plates with raised ridges typically have fewer or no diplopores present. Basals 4, large, equal‐sized, non‐diplopore bearing; average basal height is 1.5 mm, average width is 3 mm. Basals have thickened ridge around base of attachment structure (Fig. 6B). Only proximal portion of stem is known, preserved length 4.2 mm, circular in cross section with proportionally small circular lumen piercing the centre (approximately 0.2 mm in diameter). No crenulae present. Holomeric stem comprises two distinct alternating columnal sizes, one that is approximately twice as tall as the other (Fig. 6A). Upper Ordovician; Bromide Formation of Oklahoma. While E. multiporata is currently placed within glyptosphaeritid diploporitans, this assignment is likely to be changed in the future. Many authors have previously suggested that Diploporita is polyphyletic (e.g. Paul 1988; Sumrall 1997; Lefebvre et al. 2013; Sheffield & Sumrall 2015, 2017) based on wide morphological disparity within members of the group, including Glyptosphaeritida. Data do not suggest that all of Diploporita is sister to crinoids, only Eumorphocystis. Other diploporitans do not have the arm structure that Eumorphocystis does. However, without a phylogenetic analysis of Diploporita as a whole, Eumorphocystis cannot be removed from Diploporita. Thus, we retain the original taxonomic placement of Eumorphocystis, Glyptosphaeritida and Diploporita until further analysis is possible. This study demonstrates that an understanding of elemental homology within echinoderm skeletons is critical for inferring evolutionary relationships. Eumorphocystis, a Late Ordovician diploporitan echinoderm, shares homologous arm structures with early crinoids; both have a triplate arm comprising both extraxial and axial skeletal components, a coelomic canal, and a radial plate that supports the arm. A posteriori testing indicates that the most optimal tree topology is consistent with the arm structures being homologous. Results presented here strongly suggest that crinoids are rooted within blastozoans; this hypothesis is supported by rigorous phylogenetic analyses and adds to the growing number of published phylogenetic studies that have reached similar conclusions (e.g. Sumrall 1997; Ausich et al. 2015; O'Malley et al. 2016). Further, the other leading hypothesis, that crinoids and edrioasteroids share common ancestry (e.g. Guensburg & Sprinkle 2007, 2009; Guensburg et al. 2016), is not supported by the data, as a constraint tree and Templeton test indicates that this relationship is significantly less parsimonious than blastozoans and crinoids sharing common ancestry. This study is part on an ongoing effort to place early Palaeozoic echinoderms within an evolutionary framework. Many groups of these echinoderms are probably not monophyletic and the homologies of taxa within them need to be reinterpreted in order to place them within a phylogenetic analysis. In particular, the validity of diploporitan monophyly has been questioned by several authors (e.g. Paul 1988; Sumrall 1997; Lefebvre et al. 2013; Sheffield & Sumrall 2015) because of wide morphological disparity present in the feeding ambulacral systems, theca and attachment structures of taxa. By placing the diploporitans within a testable evolutionary framework, it will be possible to determine whether they represent one, natural group, or if they should be dispersed throughout the larger echinoderm tree of life. We are grateful to the following for their assistance with museum specimens: Tiffany Adrain (The University of Iowa), Brenda Hunda (Cincinnati Museum Center). This work was supported by grants awarded to SLS from The Paleontological Society, The Dry Dredgers, and SEPM, as well as NSF Assembling the Echinoderm Tree of Life project, DEB‐1036260 awarded to CDS. We are grateful to Stephanie Drumheller, Bradley Deline, Johnny Waters, and Jennifer Bauer for comments on previous drafts of this manuscript. Finally, we thank Samuel Zamora and David Wright for reviews and comments that strengthened this manuscript.